Big Five Marathon... wow what can I say! 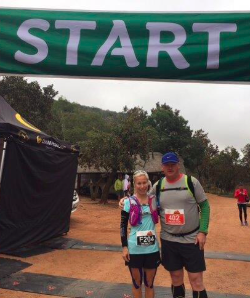 My husband and I were lucky to run The Big Five in June and what an amazing marathon. It’s not every day that you get to run with the beautiful scenery of the African savannah and alongside many of the animals that make up the Big Five. The course, whether it be the full or half, challenges in every way by throwing altitude, deep sand, rocky terrain and steep inclines at you. It builds character and humbles you, and receiving the medal at the end confirms the pain was well worth it. Yellowwood Valley is a name I promise you will never want to remember again once climbing it!! Set in the Entabeni Safari Conservancy you are totally surrounded by wildlife and most days get the option to do game drives to seek out the big five. The rangers and staff are very friendly and knowledgeable and without them race day wouldn’t be the same. They man the water stations, keep watch over the wildlife so we can run freely, entertain and cheer you on with such enthusiasm you can’t help but break into a smile. At the finish line I swore I would never run this marathon again as I was completely spent… two days later I changed my mind. Sign us up again next year Judy!! Finally a big thanks to Judy and her team for all their help with organising our travel to South Africa and securing our entry to this unforgettable event. Mission accomplished! London marathon was such a buzz, and to finish running around the Victoria Memorial in front of Buckingham Palace and down the Mall was a real pleasure. The London crowd was unbelievable, and every runner must have been given a huge boost by their encouragement and support. I reckon there can’t have been 10 metres on the whole course without someone calling out to support you. I must have high-fived thousands of those enthusiastic spectators along the route – lucky to have any hands left by the end. arrangements for travel, and accommodation were perfect, even the pick-up at Heathrow. Steve (the taxi driver) took us to the hotel, and waited while we showered, then took us on out to Excel for the expo – a great service. I know you couldn’t do anything about the bitter weather in the few hours while we out on the heath waiting for the start, but when it came to race time, we had what were probably perfect conditions for marathon running – not too hot, not too cold. We also appreciated the support of both you and Megan in London – especially in looking after Chris on race day. Fantastic, thanks! The post marathon travel was also wonderful. As we flew from Paris to Vienna, I read the Austrian Airlines magazine which featured Paris, and in particular the very area and streets where our hotel that you recommended and booked was located – south of Pigalle is the hip place to be right now in Paris. We were very familiar with Rue de Martyrs having eaten there most nights. We certainly can recommend the Hotel 3 Poussins. The day-time staff were great, and the breakfast room was in the old wine cellar! Again, thanks very much for everything. It was seamless and stress less, just the way we like things to be. 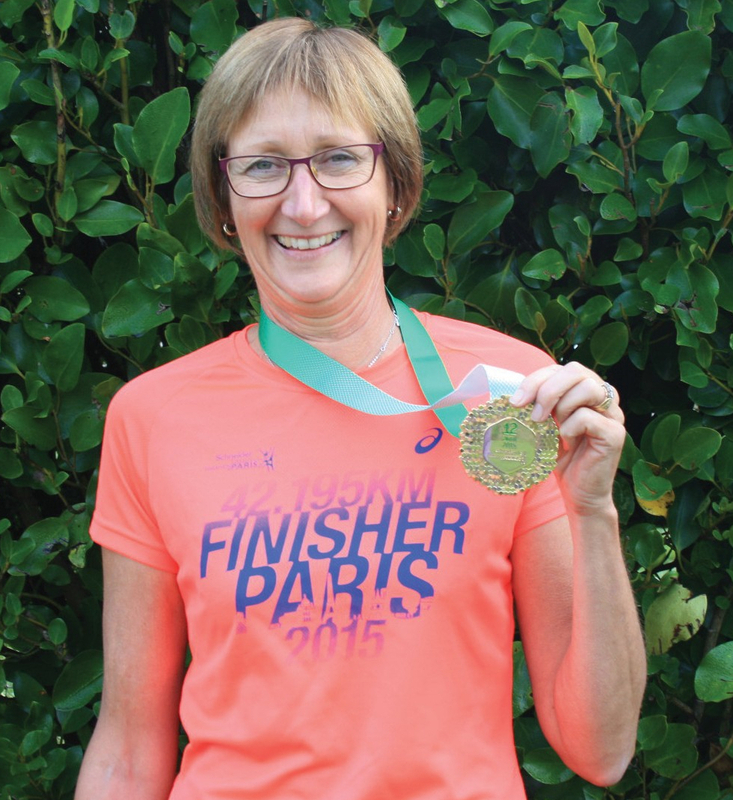 I completed the Paris Marathon in April with Marathon World Travel . Hard to believe I can run a marathon let alone through the gorgeous streets of Paris. It was magic. Paris is a beautiful iconic city, and the architecture is truly a feast for the eyes. Arriving a few days before the event gave me the chance to get my bearings and soak up some sightseeing “must do’s” before pounding the streets with the nervously excited Kiwi contingent . Meeting the other Kiwis taking part creates for great camaraderie and makes the whole trip extra special. There is nothing like the thrill of running in a famous city with 54,000 other runners from all over the world; there is just a sea of runners as far as the eye can see. And the atmosphere just carries you along. The highlights were running along the Seine past the Notre Dame Cathedral, the Louvre and the Eiffel Tower to the shouts of “Allez Allez” and “Bravo” from locals and tourists alike, crowding the streets to support us. I will definitely do another marathon with Marathon World Travel. Judy and her team take the hassle out of all the preparations, guarantee you an entry into the marathon of your choice, and are fun to be with. I decided to run the New York marathon early in 2014. It was a case of wanting to do a special international marathon worth travelling for. Going unaccompanied, I am glad I chose to go with Judy Wolff at Marathon World Travel. Judy went the extra mile in making sure I was looked after at every stage and kept the NYC 2014 marathon group well informed via Facebook and emails. We were fortunate to have fine weather even though it was cold with gusty winds on marathon day. I was overcome with emotion at the start by the cannon going off, the cheering, the recording of Frank Sinatra singing ‘New York New York’ and the sight of the magnificent Verrazano Bridge before me. The moment was so special at having arrived and running in this iconic marathon event. I had as many people calling my name in encouragement and support as for the Y symbol on my yellow Y T- shirt during the marathon. The crowds and the bands were great and LOUD! I recovered quickly and early on Monday morning went up to the Empire State Building. 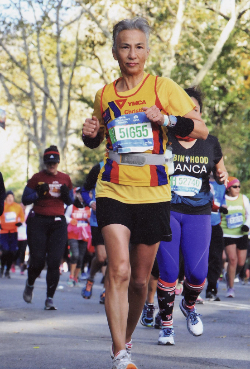 It was a beautiful clear day and so poignant to see the marathon route – the Verrazano Bridge spanning Staten Island to Brooklyn, the 59th Street Bridge at Queens to First Avenue in Manhattan then up to the Bronx, then back to Manhattan again along Fifth Avenue finishing at Central Park. The spectacular views from the Empire State Building, especially of the marathon route, gave me a real sense of pride at having completed the NYC Marathon. For that reason alone, the Empire State Building entry fee was worth every cent! Then armed with the confidence of being shown how to navigate the subway by Judy’s daughter, Kate, prior to the marathon, I explored New York independently using the subway to get me to all the sights on my agenda for the next couple of days. I had a memorable and joyful experience in New York. 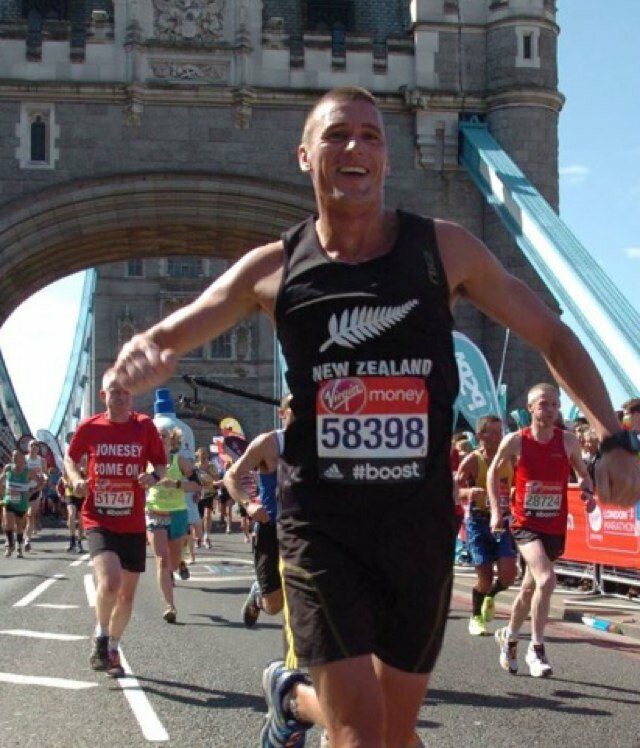 It is very difficult to get into the London Marathon, even if your goal is to raise money for charity. Luckily, I just got in touch with Judy and the team at Marathon World Travel and they sorted everything out. I have always wanted to run the six marathon majors, so London was always on the wish list. The atmosphere was absolutely incredible. The run village at the start line was a fun place to be. There was a giant screen with on going on site commentary which was great to pass the time and ease the nerves. I’m always nervous before a race, but in a relaxed kind of way. I had done all the training and felt good. So I was just nervous about going out too fast. I recommend this race to anyone who wants to run a marathon. Having run big ones and small ones I can tell you the big ones like London, where close to a million people line the street to support the runners are much easier and more enjoyable thanks to the spectators. Receive our newsletters on upcoming marathon events, running tips and interesting articles. © Copyright 2017 Marathon World Travel. All rights reserved.